Estimates for Utah coalfields of the area, average thickness, reservoir size, and carbon dioxide storage capacity of deep coal deposits that lie within 20 miles of coal-fired power plants (tonnages are millions of short tons). Concern about potential global warming caused by greenhouse gas emissions from the burning of fossil fuels has prompted the Utah Geological Survey to join a consortium of researchers from several western states (Arizona, Colorado, New Mexico, and Oklahoma) to investigate geologic reservoirs that could possibly be used to permanently store such emissions. Coal is known for its ability to hold significant amounts of carbon dioxide, a greenhouse gas, within its molecular structure. Coal beds at depths greater than 2000 feet are logistically and economically difficult to mine because of the high pressures and stresses that occur at these depths. 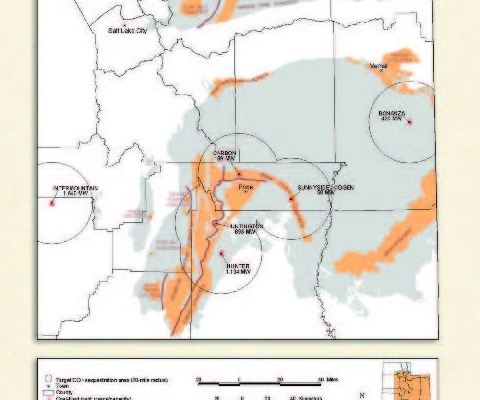 Such less-likely-to-be-mined coal deposits are present in east-central Utah, in the Book Cliffs, Emery, Sego, and Wasatch Plateau coalfields (see figure). Any of those coal deposits located within about 20 miles of the various Utah coal-fired power plants are logical targets to store greenhouse gas emissions because they are close enough to the source to make an emission-storage project potentially economic. 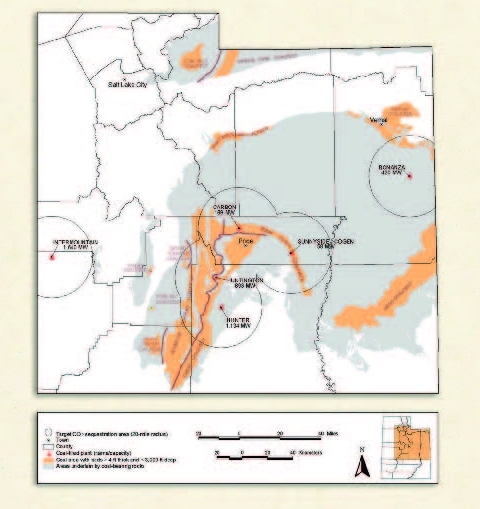 Target coal deposits at depths ranging from 2000 to 6000 feet are present in Utah in the Blackhawk and Neslen Formations of the Mesaverde Group, and the underlying Ferron and Emery Sandstone Members of the Mancos Shale. The Utah Energy Office has inventoried the amount of carbon dioxide emitted annually by Utah’s coalfired electric power plants and found that the amount varies up to 12.5 million tons depending on the size of the plant. Although no deep coal deposits occur within 20 miles of the Intermountain Power Plant in western Utah, several power plants near the Book Cliffs and Wasatch Plateau coalfields are well situated to take advantage of deep coal beds for sequestering greenhouse gas emissions. Comparison of the annual carbon dioxide emission rates for these power plants with the coal reservoir storage capacities, shows that most of the central Utah coalfired power plants could have their carbon dioxide emissions stored in deep coal reservoirs for a good portion of their expected useful lifetimes. The deep coal deposits in the Emery coalfield near Price are currently being tapped for their stored economic methane gas reserves, and a network of pipelines and wells is currently in place that could also be used for carbon dioxide sequestration efforts. As methane reserves in that area decline, pumping greenhouse gases into the coal reservoirs might have the added benefit of enhancing methane production by flushing out additional recoverable coalbed methane. Based on this quick inventory, it appears that deep coal resources near existing coal-fired power plants in central Utah could theoretically provide adequate reservoirs to store carbon dioxide emissions for at least 35 years, or the expected life of at least several of the power plants. Whether it is technically and economically feasible to sequester greenhouse gas emissions of coalfired power plants in deep coal beds remains the subject of future research.